Most college students endure early morning classes, long hours in the library, and 10 page term papers, all in hopes of graduating and landing the perfect job. However, how do you know what your dream job entails or whether that dream job really suits you and your interests if you’ve never truly experienced it in the real world before? Luckily, I avoided the “ifs” and “buts” by stepping out of my comfort zone and landing the perfect hands on content marketing internship at Zion & Zion. The benefits of a content marketing internship go far beyond the professional experience you gain while working with the experts themselves. How you ask? Here you will read just how rewarding an internship in content marketing really is and how you can produce engaging content by working under the professionals themselves. If you haven’t heard the words “content marketing” lately, you have a bit of catching up to do in the world of advertising. Now more than ever has the demand for internet marketing been at an all-time high, and content marketers are the skilled professionals who swoop in to save the day. While the demand for printed newspaper services slowly decline, writers have jumped ship and started creating unique and valuable content to help spread brand awareness in a whole new way! Content marketing is a strategic process of creating unique and valuable content which is relevant to the user to increase brand awareness. Although many tend to think towards written content specifically, a content marketer finds ways to accomplish their goals through numerous mediums. Ranging from white papers to eye-catching infographics, content marketing is a part of it all! Coming from a former intern like myself who was recently hired as Associate Content Developer, I understand that an internship can be quite intimidating. We all have experienced the nerve reckoning application process, intense interview, and dreaded hours waiting for the phone call or email that determines if you have what it takes. I agree, it can be stressful, but take a look below and see how the benefits of a hands on internship can make every second worth it! So far you have read and liked the description of a content marketer, but that is just the beginning to learning what this job role entails. How do you know you like something unless you have given it a try? An internship in content marketing is the perfect opportunity to fully assess what you like and dislike in regards to the field. Like many job descriptions, the challenging opportunities you are faced with as a content marketer don’t all fall within the same category. An internship is the time to really focus on what you could see yourself doing in the possible future. Here are a few questions I like to ask myself while completing tasks given to me to better learn if I could see this being the career path I want for myself. Did you enjoy the assigned task? What did you like/not like about it? Did you struggle with the task, or was it easy to accomplish? Is the finished product up to employee standards? Could I put this in my portfolio to reference in the future? The work you accomplish while interning reflects on what you may be doing when you land your first full-time position in the field. This being said, it is just as important for you to assess your work as it is for the company who hired you as an intern to. Really take the time and ask yourself if your initial interest in content marketing was what you expected and if it is something you would love to continue to do. I am sure the possibilities of you exploding with excitement back when your professor assigned the class an extensive research paper is pretty small. In the end, I couldn’t be happier to have completed them! It was those long research papers that allowed me to become the content savvy writer I am today. Taking the writing skills I developed in college and applying them to the development and strategy process behind content marketing helped improve my writing skills substantially! Nothing is quite a motivator like having to show what you have to offer as an intern. Here I listed out a few of the tasks I was given to help improve both my writing and grammar skills this semester. Remember, you are at the internship to develop the required skills to excel in the field, so ask questions, get feedback, and always look for ways to improve. Whether you were lucky enough to choose your own topic, or were assigned to write about something you had no clue about, think back to those research paper days where you were forced to research a topic until you understood it inside and out. In college, you likely conducted the necessary research and converted it into your own words to turn in to the professor. Boom! That right there is a major part of content development. 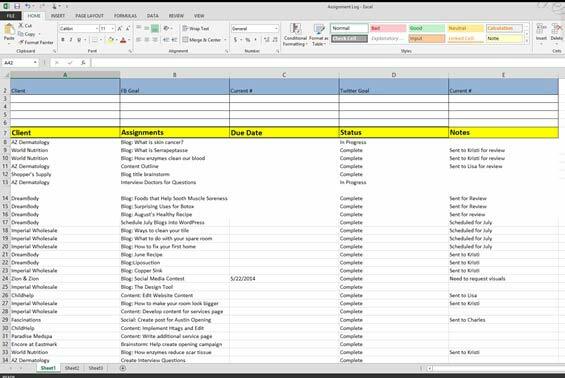 While you might not hand in your findings to a professor as a content marketing intern, you are using the research to find factual information about competitors, gathering strategic ideas, and learning about a client’s company and business. Knowing how to conduct research is essential to stay ahead of the competition and develop a creative strategy used to impress clients. You don’t want to do what everyone else is doing, but you want to keep up with the trends which must be achieved through genuine extensive research. A good website is one that allows a user to find the necessary information about a particular product or service. A great website is designed to deliver a positive user experience and facilitate action easily and accurately. As a former content marketing intern, I was able to get the behind the scenes look into the development of a great website. While website development wasn’t really an area in which I was expecting to sharpen my skills, it was a perfect opportunity for me to continue learning and broaden my horizons. Not only did I partake in writing content for upcoming websites, but I also created some of the unique infographics implemented into the new design. During more of a hands on internship approach such as content marketing, you are always encouraged to put forth ideas, both written and visual, to help optimize a website’s functionality. The main purpose of a resume is to provide a potential employer your summary of skills, relevant job experience, and highlight your accomplishments in an impressive and organized document. A resume is a critical tool necessary for job searching and needs to capture the interest of the reader in seconds. 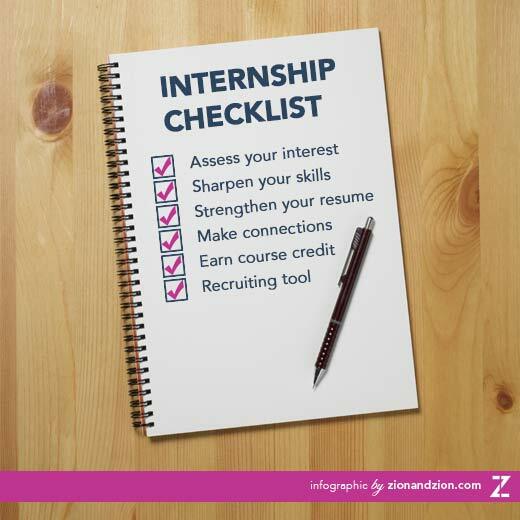 An internship is the perfect way to fill the empty space on your resume with valuable and beneficial content. If you make the most out of an internship and take full advantage of everything it has to offer, you will develop the profound skills and professional knowledge in various areas of the industry. The more knowledge you gain about the industry as whole, the easier it is to sell both you and your internship as committing to the position. 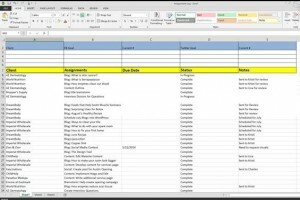 Keep track of your work! You are there to work and gain valuable experience, but what’s the point if at the end of your internship you have nothing to show for it? Always record what projects you have worked on, both individually and as a team, to help show future employers just how exceptional you really are. Now this isn’t a place for pictures, but is an assortment of work you have accomplished related to the field to give you the competitive advantage you need to stand out from other applicants. As a content marketing intern, you are provided with endless opportunities to create content which is then published to the public. These are perfect examples to include in a portfolio and can help you answer questions during an interview. While an interviewer could ask all applicants the same questions during the interview, having a portfolio filled with work that supports your answer(s) will help you to be remembered. Here are a few example documents you can add into a professional portfolio of your own after an internship to help build your confidence and strengthen your response during an interview. Avoid the fillers we tend to say when trying to rack our brain of ideas and specifics of how we can answer the question in the best possible manner. Support your answers by referencing a professional portfolio with the work you accomplished throughout a content marketing internship. Network… network… and network some more! Talking to the industry experts is the perfect way to build relationships that may just come in handy later on down the road. This world is smaller than you think, and this industry is no different. Making and maintaining a professional relationship with the experts in the field can provide you with potential opportunities in the future. It’s much more difficult to try and meet experts in the industry on your own. Through my internship, I was invited to numerous networking events which I otherwise would not have been able to attend. An internship provides you with the possibility of attending exclusive events where you can share knowledge and gain exposure with people within your industry. This will ultimately increase your confidence and have you attending events regularly to receive advice and ideas that you can use to raise your profile. Although the internship is there to develop skills you can apply to a career, it is also a great opportunity to make connections and continue to grow in your field. If you are one of the lucky students who MUST partake in an internship to graduate, this might be one of the best requirements you were given! 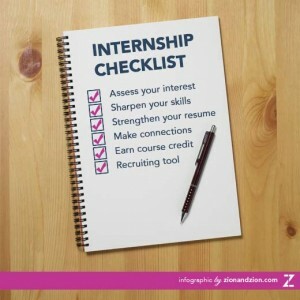 Many internships offer credit towards your degree while learning in a professional environment. This is a perfect way to gain work experience while raising your GPA. Not to mention it is acknowledged as an internship on your official transcript. Be sure to talk to your academic counselor and employer to identify all the requirements that must be fulfilled (dates, hours, coursework etc.) in order to receive full credit. Don’t be selfish, internships aren’t just for you! Employers offer internships because it is also a great way to see if students have the potential to become a part of their team professionally and culturally. Today more than ever, internships have been used as a recruiting tool to help seek the potential of college students. This is the perfect opportunity for them to “test drive” the talent and ambition a new hire might require. Starting out as a content marketing intern, I was able to get a feel for what the field all entailed and I loved it! With my growing interest in content, I was motivated to grasp as much knowledge as I could about this fascinating industry. In return for my hard work and dedication to all of my assigned tasks, I was asked to join the team permanently as an Associate Content Developer! That’s right, I landed a job. Not only was Zion & Zion assessing my skills, but I also experienced firsthand if an advertising agency was the perfect fit for me before committing to a full-time position. Give it your all! Whether you find yourself wanting to be a part of the organization or feel like the field isn’t for you… make the most out of it! There are rewards for working hard, anything from a job offer to a letter of recommendation will help you along your journey of finding whatever job you truly enjoy. Internships are a continuous cycle for companies to evaluate potential employees and also provides you with the chance to evaluate them and their workplace. If you deliver a high level of productivity and can work independently as well as be a team player, an internship may be just what you need to help land your first full-time position after college. Convinced yet? An internship in content marketing has endless possibilities! Finding the right internship can be just as hard as applying for one, so do your research and take the leap. Early interning gives you time to develop all areas of an industry, so the sooner the better! Apply to become a content marketing intern at one of Phoenix, Arizona’s top advertising agencies Zion & Zion for our upcoming semester. Nothing beats the hands on experience you receive while working with true professionals in the field. You will experience everything involved in the industry and ease your transition to entering the workforce, so what’s stopping you?! Next post : What is jQuery?